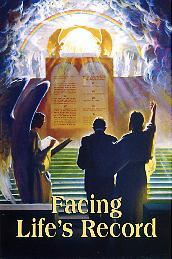 Restore >> Library >> "Facing Life's Record" ..
"A book of remembrance" is written before God, in which are recorded the good deeds of "them that feared the Lord, and that thought upon His name." Malachi3:16. Their words of faith, their acts of love, are registered in heaven. Nehemiah refers to this when he says: "Remember me, O my God, . . . and wipe not out my good deeds that I have done for the house of my God." Nehemiah 13:14. In the book of God's remembrance every deed of righteousness is immortalized. There every temptation resisted, every evil overcome, every word of tender pity expressed, is faithfully chronicled. And every act of sacrifice, every suffering and sorrow endured for Christ's sake, is recorded. Says the psalmist: "Thou tellest my wanderings: put Thou my tears into Thy bottle: are they not in Thy book?" Psalm 56:8. There is a record also of the sins of men. "For God shall bring every work into judgment, with every secret thing, whether it be good, or whether it be evil." "Every idle word that men shall speak, they shall give account thereof in the day of judgment." Says the Saviour: "By thy words thou shalt be justified, and by thy words thou shalt be condemned." Ecclesiastes 12:14; Matthew 12:36, 37. The secret purposes and motives appear in the unerring register; for God "will bring to light the hidden things of darkness, and will make manifest the counsels of the hearts." 1 Corinthians 4:5. "Behold, it is written before Me, . . . your iniquities, and the iniquities of your fathers together, saith the Lord." Isaiah 65:6, 7. The law of God is the standard by which the characters and the lives of men will be tested in the judgment. Says the wise man: "Fear God, and keep His commandments: for this is the whole duty of man. For God shall bring every work into judgment." Ecclesiastes 12:13. The apostle James admonishes his brethren: "So speak ye, and so do, as they that shall be judged by the law of liberty." James 2:12. Jesus will appear as their advocate, to plead in their behalf before God. "If any man sin, we have an advocate with the Father, Jesus Christ the righteous." 1 John 2:1. "For Christ is not entered into the holy places made with hands, which are the figures of the true; but into heaven itself, now to appear in the presence of God for us." "Wherefore He is able also to save them to the uttermost that come unto God by Him, seeing He ever liveth to make intercession for them." Hebrews 9:24; 7:25. As the books of record are opened in the judgment, the lives of all who have believed on Jesus	come in review before God. Beginning with those who first lived upon the earth,	our Advocate presents the cases of each successive generation, and closes with the living. Every name is mentioned, every case closely investigated. Names are	accepted, names rejected. When any have sins remaining upon the books of	record, unrepented of and unforgiven, their names will be blotted out of the	book of life, and the record of their good deeds will be erased from the book	of God's remembrance. The Lord declared to Moses: "Whosoever hath sinned against Me, him will I blot out of My book." Exodus 32:33. And says the prophet Ezekiel: "When the righteous turneth away from his righteousness, and committeth iniquity, . . . all his righteousness that he hath done shall not be mentioned." Ezekiel 18:24. "He that covereth his sins shall not prosper: but whoso confesseth and forsaketh them shall have mercy." Proverbs 28:13Proverbs 28:13. If those who hide and excuse their faults could see how Satan exults over them, how he taunts Christ and holy angels with their course, they would make haste to confess their sins and to put them away. Through defects in the character, Satan works to gain control of the whole mind, and he knows that if these defects are cherished, he will succeed. Therefore he is constantly seeking to deceive the followers of Christ with his fatal sophistry that it is impossible for them to overcome. But Jesus pleads in their behalf His wounded hands, His bruised body; and He declares to all who would follow Him: "My grace is sufficient for thee." 2 Corinthians 12:9. "Take My yoke upon you, and learn of Me; for I am meek and lowly in heart: and ye shall find rest unto your souls. For My yoke is easy, and My burden is light." Matthew 11:29, 30. Let none, then, regard their defects as incurable. God will give faith and grace to overcome them. We are now living in the great day of atonement. In the typical service, while the high priest was making the atonement for Israel, all were required to afflict their souls by repentance of sin and humiliation before the Lord, lest they be cut off from among the people. In like manner, all who would have their names retained in the book of life should now, in the few remaining days of their probation, afflict their souls before God by sorrow for sin and true repentance. There must be deep, faithful searching of heart. The light, frivolous spirit indulged by so many professed as Christians must be put away. There is earnest warfare before all who would subdue the evil tendencies that strive for the mastery. The work of preparation is an individual work. We are not saved in groups. The purity and devotion of one will not offset the want of these qualities in another. Though all nations are to pass in judgment before God, yet He will examine the case of each individual with as close and searching scrutiny as if there were not another being upon the earth. Everyone must be tested and found without spot or wrinkle or any such thing. before the appearing of the Lord in the clouds of heaven. Christ in the Revelation, looking forward to that time, declares: "He that is unjust, let him be unjust still: and he which is filthy, let him be filthy still: and he that is righteous let him be righteous still: and he that is holy, let him be holy still. And, behold, I come quickly; and My reward is with Me, to give every man according as his work shall be." Revelation 22:11, 12. The righteous and the wicked will still be living upon the earth in their mortal state — men will be planting and building, eating and drinking, all unconscious that the final, irrevocable decision has been pronounced in the sanctuary above. Before the Flood, after Noah entered the ark, God shut him in and shut the ungodly out; but for seven days the people, knowing not that their doom was fixed, continued their careless, pleasure-loving life and mocked the warnings of impending judgment. "So," says the Saviour, "shall also the coming of the Son of man be." Matthew 24:39. Silently, unnoticed as the midnight thief, will come the decisive hour which marks the fixing of every man's destiny, the final withdrawal of mercy's offer to guilty men.